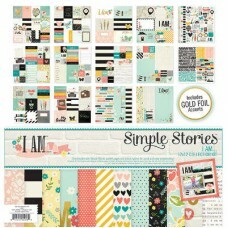 Simple Stories I Am 12 x 12 Collection Kit. The pack contains 6 sheets of 12x12 double sided designer cardstock papers, 6 sheets of double sided signature element pieces, sizes 2x2, 3x4, 4x6, 6x8, 4x4, 2x12, 4x12, and 6x12, a 12x12 sheet of fundamentals cardstock stickers, a 12x12 sheet of expressions cardstock stickers. 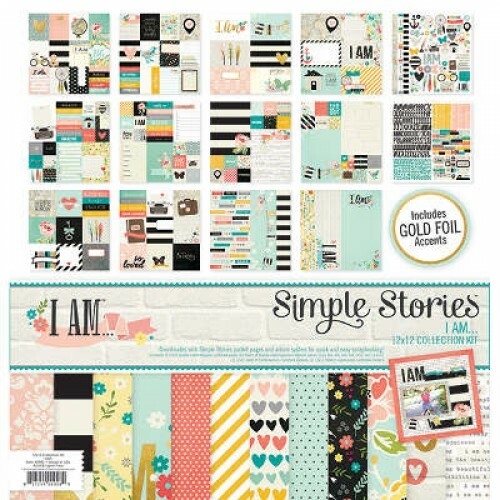 Simple Stories, We Are Family 12 x 12 Collection Kit. The pack contains, 6 sheets of 12 x 12 double ..